Now three months into the travel window of the summer’s best value added package program ‘the Barbados Island Inclusive’, the Barbados Tourism Authority has relaunched the program with an August booking window. 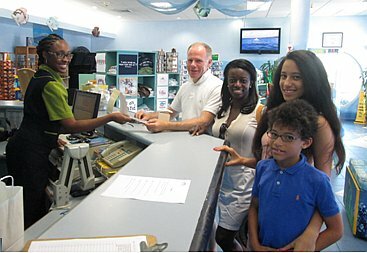 Pictured above from left, presenting their “free spending money vouchers” to Leeanne Brathwaite of Atlantis Submarines is a family from the United Kingdom Mr. Martin Hoare, Mrs. Nana Anima-Marfoh, Georgia and Eben Marfoh-Hoare. The programme has now been relaunched with a booking window of August 7th – September 21st, travel must be completed by Dec 21st 2013 and for queries and full details visit http://www.visitbarbados.org/islandinclusive. Mrs. Myers went on to say “ With the August 10th concert by world renowned artist Fantasia and the start of advertising for the November 1st concert by Barbadian entertainment icon Rihanna, the Barbados Island Inclusive package is the ideal marketing tool to seal the deal on making Barbados the destination of first choice for many this year. Indeed the calendar for the remainder of the year is filled with entertainment and sporting activities”. August is still a major travel period especially for families so guests can enjoy the savings if they make a late summer travel decision or decide to join us in the fall. Guests can book accommodation directly with the participating hotels or directly with Atlantis Submarines on their booking engine www.barbados.atlantissubmarines.com/bookings or through the Barbados Hotel and Tourism Association’s booking engine Book Barbados Now.